Today we’re having a day off with the family. We promised the kids a day with dolphins, that is to say: the sea creatures, and not The Dolphins TM. When planning to go out on a trip like that, or any trip with the sun out, make sure you bring water and plenty of it. It keeps the body hydrated and the headache away. The company that runs the place is called Dolphin Pacific Sea Adventures Pro, and has its base off Koror. 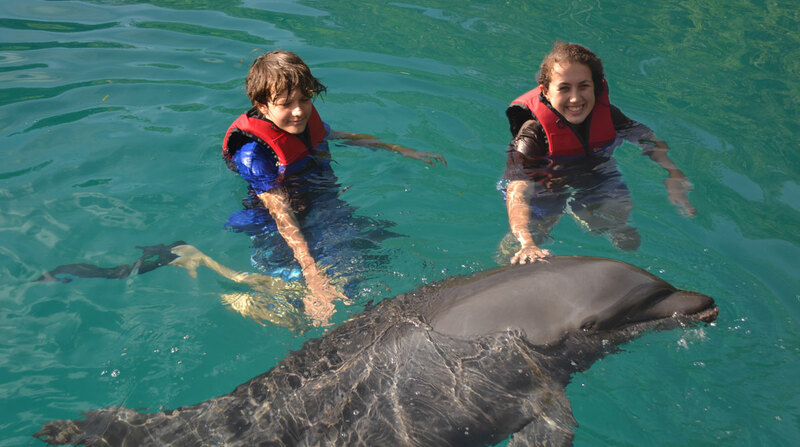 They take their guests from Koror to the area where the dolphins are kept and taken care of, with a fast boat. A slower boat would definitely do as well and probably give much better mileage, but the speed was half the fun for the dads already. The company has built some buildings in between a number of such rock islands, connecting them with floatable pathways. There were currently 5 dolphins, all females. You can google the reason why. Dolphins can weigh up to approx. 200 kilos with a length of over 2 meters. They eat fish. A lot. The dolphins at the location actually eat a variety of four types of fish, including sardines. Marthe and Eskil got the entire ‘Dolphin Trainer’ program, with the details depending on the trainer on duty. Their trainer, a Palauan local, shared everything he knew with not holding back. Eskil and Marthe got to see behind the scenes, and a Dolphin center doesn’t exactly look like a modern hospital: this was the real deal. The program with Bente and Krister got us into close contact with them, including getting splashed by them summer-saulting in the air, shaking hands, and patting them on the back and belly (there’s now a new saying in town: a smooth as a dolphins belly). With Marthe and Eskil occupied with dolphins the remainder of the day, we decided to take Krister and Bente for a swim at the Palau Royal Resort. The pool area was quiet and there was enough shadow to not turn lobster. Food prices are reasonable, considering the standard of the place, with USD 3,5 for a soda and 6 USD for nice fries. Bring your own water as it’s the same price as for a soda for 600ml. Be sure not to fall for the frozen pizza; for some reason the kitchen does not know how to heat it properly – and will fail as many times as you send the pizza back. Marthe and Eskil came back at 16.00 again. I went to pick them up and to order the pictures. A wonderful experience that will last them a life time, or at least until next wednesday.